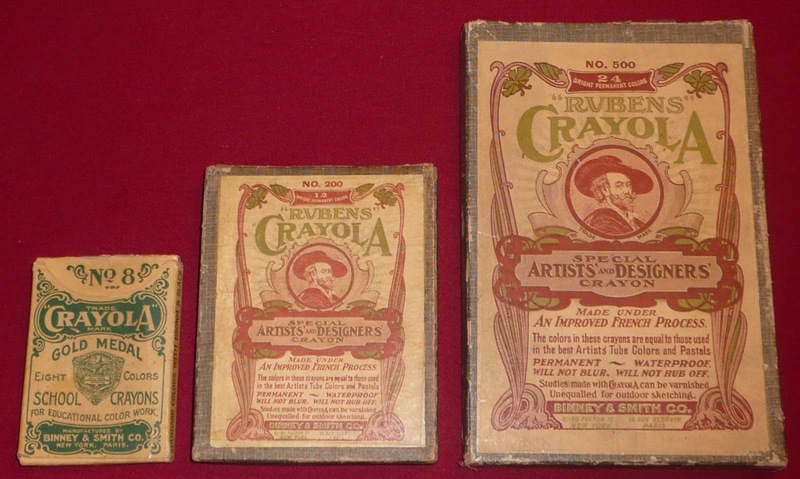 Recently, a Rubens-Crayola No 200 box came up for auction on eBay. It sold for nearly $300 and I was fortunate enough to win the auction. I've personally been waiting 12 years to see one of these. It's one of the only boxes I'd never seen in pictures, ads or in a collection. I already had a very clean version of the Rubens-Crayola No 500 box. I've had that one for years and the crayons inside are unused. There are very few of these around either. I know of only two. For years I had the only one that had ever surfaced to the collecting community and then another, much rougher condition one came up on eBay. I often wondered what the No 200 looked like. I guess it never occurred to me that it would be a smaller version of the No 500 but that makes perfect sense given all the other sizes look the same (but not like these two). As I put the newly acquired box up into my collection, I thought, "I'll bet a pair of these haven't been together for at least 50 years, maybe more!" It has been nearly a hundred years since they were available for sale at retail. 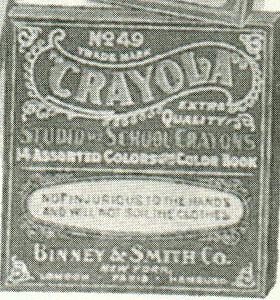 They ran these from 1903 until 1914 and that was the last time we saw Crayola use the large sized crayons for many, many years. That leaves me with just two of the original boxes to acquire. I've personally seen one of these boxes. There's a No 49 in the Smithsonian in the National Archives. As for the No 57, I knew somebody years ago that had one. She might still have it but it's been about 10 years and I'd lost track of her. Sometimes collecting is a slow process. This blog is different than the crayoncollecting.com web site. Here you will find stories, features, trends and opinions. You can also comment; not a feature I have on the current web site so I welcome your input. Just who is Crayola's Tip? The Real Tale of the Color "Flesh"